In my evening walk with the dogs, I came across a young couple out for a walk. I offered a friendly “Hello” and the response came from the young man of the couple, “Good morning”. I was immediately aware of the mistake offered by the young man. Being in a pleasant neutral place myself, I simply returned a friendly smile and I continued on my walk. This experience immediately engaged my thoughts in multiple directions. First I felt pleased that I was in the moment enough to be aware that it was not indeed morning and that the young man’s mind was somewhere else entirely to have offered this greeting up. Additionally I was happy to have not been critical of the greeting. This would likely not have benefited our momentary friendship. So I was delighted that I managed to both be aware of the mistaken greeting, and aware enough to not offer criticism in response. I thought on this for some time as I walked away, pondering the dialog, the possible outcomes and my ability to stay in the moment. It was some minutes later that I realized that I was about half a mile away from the lovely young couple and still talking with them in my mind. The dogs I was walking were still in the moment, the moment was continuing to occur around me, but I was no longer with it. 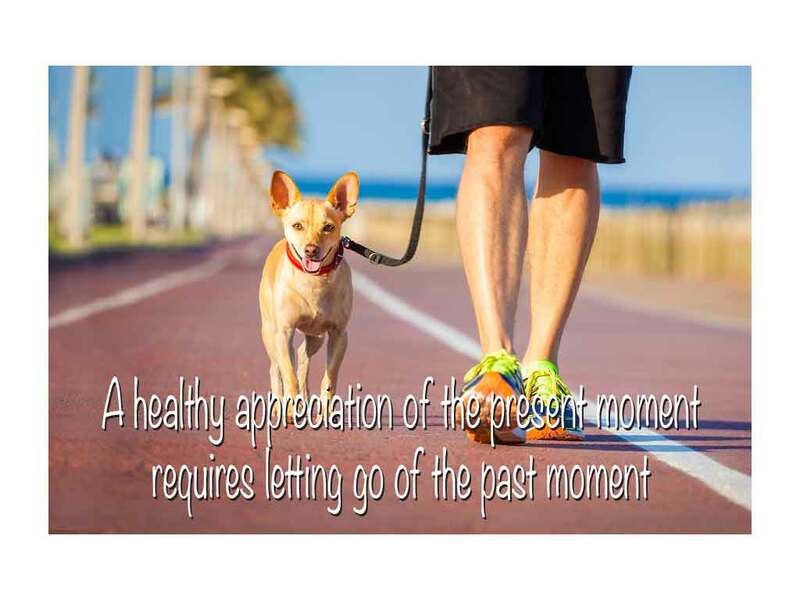 A healthy appreciation of the present moment requires letting go of the past moment, so we don’t miss each moment as it occurs. If you never let go, you will never be in the moment.